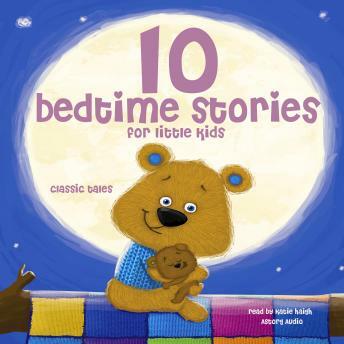 Listen to "10 bedtime stories for little kids" on your iOS and Android device. This collection of 10 bedtime stories will help your child drift into a peaceful sleep, by concluding his day with delightful adventures, important teachings and symbolic imagery for enlightening dreams. Classic children's stories and fairy tales are an essential part of any kid's development. Our audiobook collection means to bring together the fairy tales, stories, myths and legends which have fed the children of many generations in the years when the imagination is awakening and craving stimulus and material to work upon. This compilation, specially designed for small children, includes folk tales, classic tales by Charles Perrault and Hans Christian Andersen, and stories from the Arabian Nights, narrated in a warm and soothing way: The Story of Peter Pan, by James Barrie; The Elves and the Shoe Maker; The Princess and the Pea; The Wolf and the Seven Little Kids; Little Red Riding Hood; The Wolf and the Fox; The Frog Prince; The Ridiculous Wishes; and The Little Match Seller.